The Cuban Revolution, carried today by Raul Castro, set an example for other Latin American nations and became the shining example of a successful campaign to resist U.S. intervention. In time, more countries began to look to Cuba as a model for their own revolutionary goals in an effort to spread Marxist ideology throughout Central and South America. Salvador Allende’s efforts to spread the beliefs throughout Chile would be in good faith but severely short-lived. On September 11, 1973, he was overthrown in a military coup led by the late General Augusto Pinochet. Allende, who died of reportedly self-inflicted gunshot wounds, tried unsuccessfully to lead Chile down the path of socialism inspired by his Marxist-Leninist beliefs. The removal of Allende and assumption of power by Pinochet, would bring Chile some of its darkest days. Political suppression, unemployment, famine, murder and corruption became constant aspects of Chilean society under a dictator with an insatiable appetite for power, greed and subordination. Pamela Constable and Arturo Valenzuela bring the past to life with this excellent historical account of a crucial period in the history of Chile. Under Pinochet, the dreams of change, freedom and economic prosperity began to fade as the income gap between the rich and the poor became the largest in the country’s history. Poverty, depression, health issues and domestic surveillance by the notorious DINA would transform a once free society in a military state. Freedom of press, expression and religion became archaic ideas subject to intimidation, imprisonment and in some cases, death. Schools and universities were under rigorous scrutiny in efforts to purge them of any ideological teachings by the far left bearing a haunting similarity to Nazi controlled Germany. Old opposition movements began to re-form and newer organizations began to take shape eventually dividing Chilean society between Communist, Christian Democratics, Humanist parties and pro-regime organizations. Tension began to simmer and Pinochet’s time in office began to see its last days. His reign lasted from 1973 until October 1988, when the Chilean people demanded change and elected Patricio Aylwin by a large margin bringing democracy back to a country in need of hope and security. His election was a culmination of years of disillusionment by the Chilean public, and even the Regan administration. The Chile we know today is far removed from its darkest days under one of the most notorious dictators in Latina American history. 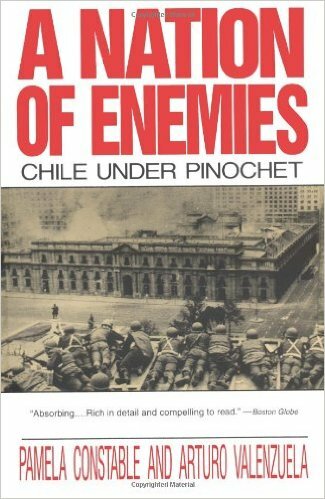 This book is a must read for anyone interested in the regime of Augusto Pinochet and Chilean politics.